Our research interests broadly span the interface between animal behavior and plasticity’s role in evolution. In particular, we are interested in causes and consequences of behavioral plasticity within- and across-generations, their influence on evolutionary patterns, and the underlying processes by which experience results in behavioral phenotypes. We use two excellent models of plasticity and evolution, the Trinidadian guppy (Poecilia reticulata) and the threespine stickleback (Gasterosteus aculeatus), to investigate outstanding questions in this field. ​How do organisms integrate information from multiple sources? Organisms can gain information about their environment from their genes (evolutionary history), their parents (transgenerational plasticity), or their own personal experience (juvenile developmental plasticity). Recent evolutionary theory seeks to predict how and why organisms may attend to cues from different sources. In guppies, I am testing how offspring respond to predator cues based on their population history, maternal experience, and personal experience. Early results suggest that while populations may differ in their behavioral response to predation risk, both maternal and personal cues of risk result in similar phenotypes. Continuing work will examine how these cues cascade at the genomic, neural, and physiological levels to produce an integrated phenotype. In stickleback, I found a similar result: both fathers and personal experience are redundant at the phenotypic and molecular levels. Offspring of predator-exposed fathers and offspring that had been exposed to predation risk produced similar morphological and behavioral phenotypes and showed similar patterns of gene expression in the brain. The similarity between these two systems suggest a potential general rule in vertebrates for utilizing information from multiple sources. The combination of genes, parental experience, and personal experience work together to influence neural and endocrine mechanisms over development. This complex, integrated phenotype is then exposed to selection. Grey box indicates where information is integrated in this paradigm. 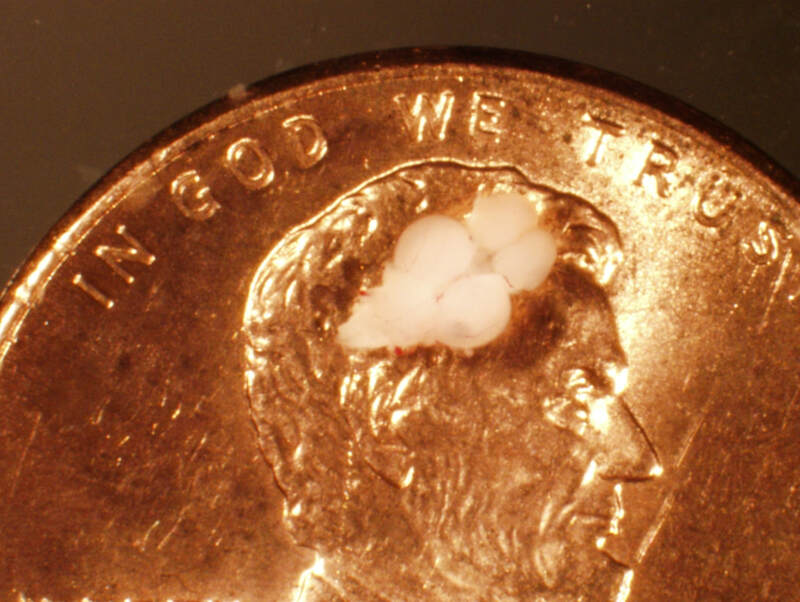 Guppy brains are pretty small! Photo by Eva Fischer. ​By what mechanisms do an individual's experience result in changes in behavior? ​My postdoctoral research is working to understand how experience and population history interact to produce behavioral phenotypes. Using genomic, neuroendocrine, and epigenetic approaches, my current research seeks to elucidate the link between experience, brain, and behavioral outcomes using the Trinidadian guppy. We have found evidence suggesting that small RNAs may play a role in plastic responses to predation risk. Can transgenerational plasticity influence population divergence? How and when should we expect transgenerational plasticity to evolve? Using the guppy and stickleback systems, I am examining the strength and direction of predator-induced maternal and paternal effects across multiple different populations. 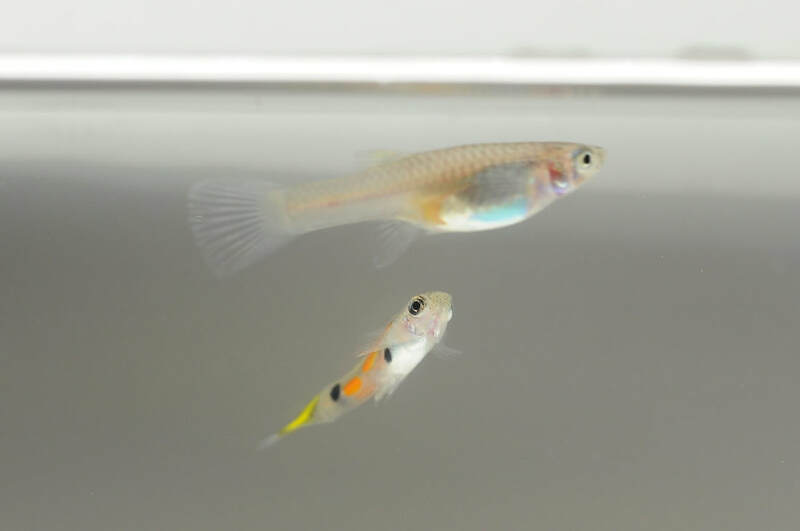 Current projects in guppies are evaluating these patterns across multiple high- and low-predation population pairs and working to identify mechanisms underlying maternal transfer of information to offspring. I have also tested whether and how plasticity can influence colonization of novel environments and adaptive radiations. Some models posit that plasticity in ancestral populations shapes the evolutionary trajectories of derived populations. Therefore, divergence occurs in derived populations in the direction of ancestral plasticity, but then phenotypes in derived populations become canalized. These models predicts that 1) evolution occurs in the direction of plasticity, and 2) there will be greater plasticity of ancestral phenotypes relative to derived populations. I have found that ancestral populations show greater variation in plastic responses to novel predators than derived populations, potentially providing different trajectories on which selection can then act. Ancestral male (left) and derived male (right) stickleback fan their nests in the lab. 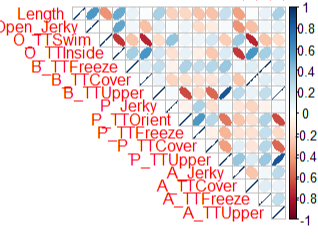 How do suites of correlated behaviors influence ecological and evolutionary patterns? What are the underlying mechanisms of behavioral correlations and divergence? Behavior has been traditionally thought of as both flexible (e.g. decision-making) and static (e.g. stereotyped mating behaviors). However, a growing literature examining individual differences shows that we do not always see flexibility where it is expected, and even the most rote sequences of behaviors vary between individuals. Do these individual differences reflect true evolutionary patterns, or are they simply noise around a mean? I am broadly interested in the causes and consequences of consistent individual differences in behavior across time and/or context (“behavioral type” or “personality”), and how these differences influence life history traits and evolutionary patterns. In my postdoctoral research with Kim Hoke and Kim Hughes (Florida State University), I am currently utilizing a QTL breeding design to investigate phenotypic and genetic correlations underpinning repeated behavioral divergence among high- and low-predation populations of guppies. Early results show that strong phenotypic correlations within populations break apart within one generation, suggesting that such correlations may not act as a strong constraint on recurring behavioral, morphological, and life-history divergence in guppies. I have also examined whether individual variation affects parenting behaviors and the resulting fitness consequences in relevant ecological and evolutionary contexts. I have found that males from two different populations exhibited consistent individual differences in parenting style in both the lab and field, across time and across clutches, and evidence for a behavioral syndrome in wild populations, such that males that parented at a higher rate were more attentive to different territorial intruders. How do major adult/life-history events affect long-term behavior across multiple contexts? 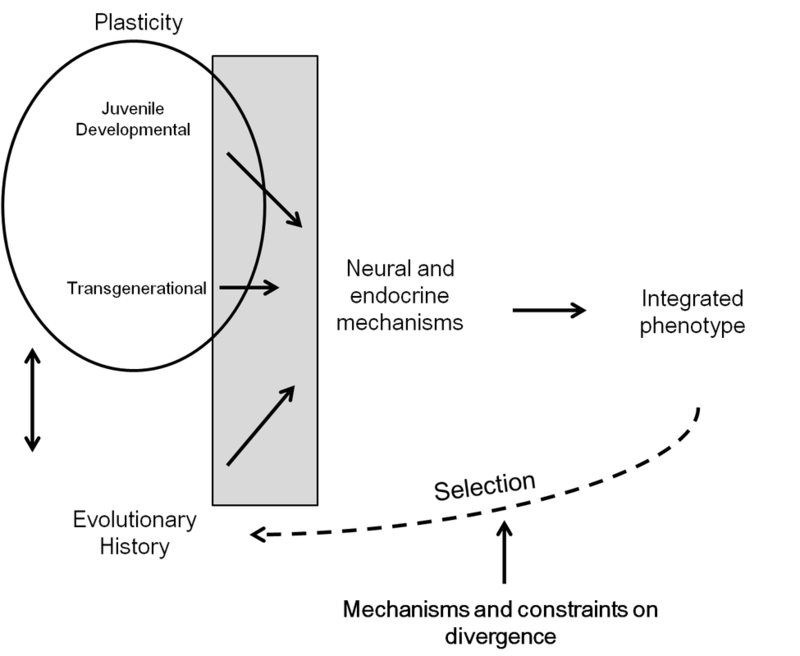 Plastic responses are often thought to be more pronounced and/or occur primarily during early development or at the juvenile stage. However, many organisms undergo dramatic morphological and physiological changes during their lifetimes that may influence future behaviors. Parenting and reproduction are major life-history events that can have profound impacts on behaviors across many different contexts. Working with undergraduates at Colorado State University, we have found that male guppies that have had reproductive experiences increase anti-predator behavior and show greater brain activity in brain regions associated with fear than their virgin brothers (Sinner et al. in prep​). 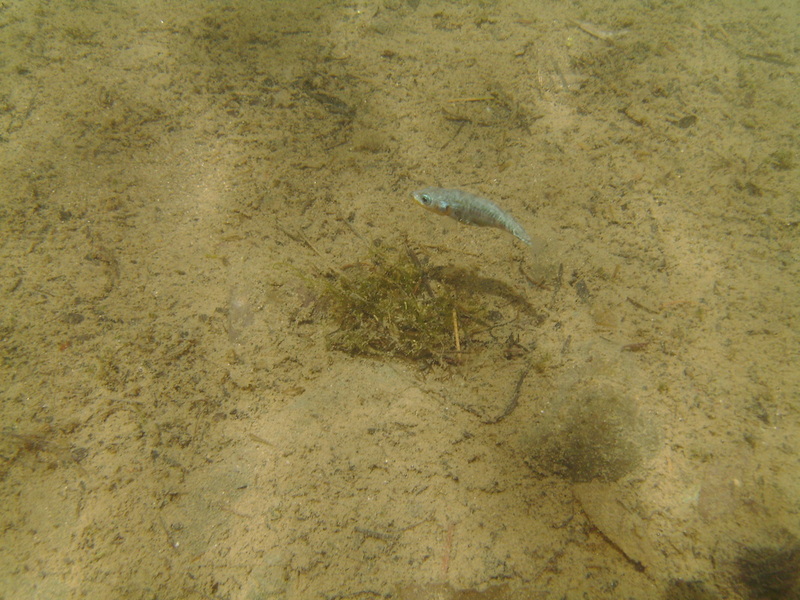 In conjunction with an undergraduate researcher at University of Illinois, we have found that parenting stabilizes risk-taking behaviors in male stickleback, and that this may be due to variations in 11-kT that occur during parenting (Stein et al. 2016). Male stickleback and his fry. Can fathers have similar influence on offspring development as mothers? How do fathers influence offspring development? Nongenetic parental effects have received much recent attention, as they can influence offspring behavior, development, and fitness, and may facilitate rapid, adaptive evolution. However, while there exists a rich literature on maternal influences on offspring, relatively little is known about paternal effects. I have found that a father's experience with predation risk while he is parenting affects offspring morphology, behavior, and physiology. I am currently working to elucidate potential mechanisms underlying transgenerational transmission of environmental cues from fathers to offspring.